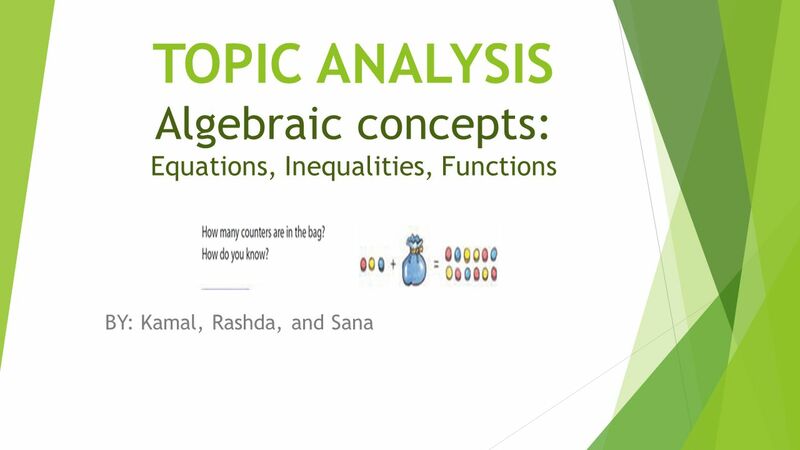 TOPIC ANALYSIS Algebraic concepts: Equations, Inequalities, Functions BY: Kamal, Rashda, and Sana. 3  Patterns, Input and Output, Data in a table. 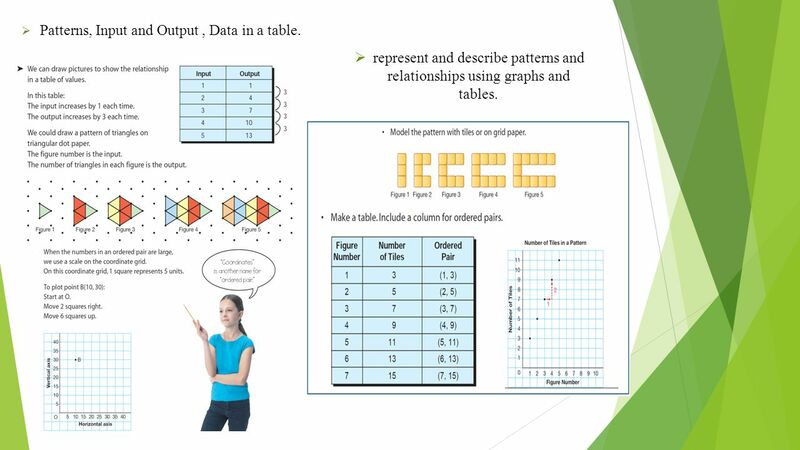  represent and describe patterns and relationships using graphs and tables. 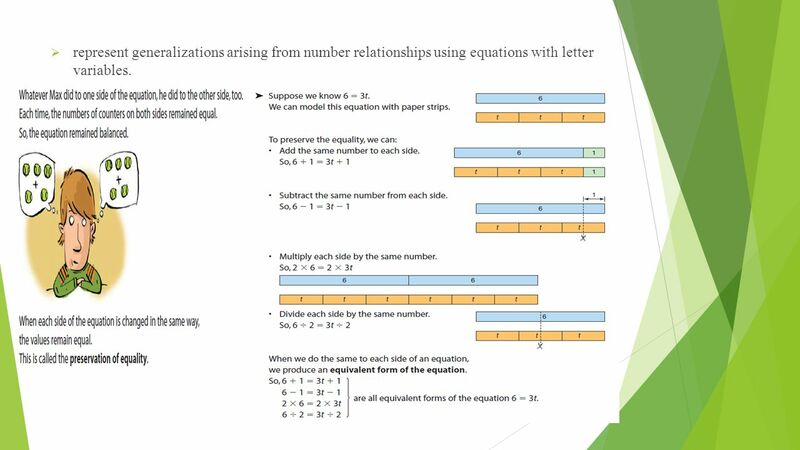 5  represent generalizations arising from number relationships using equations with letter variables. 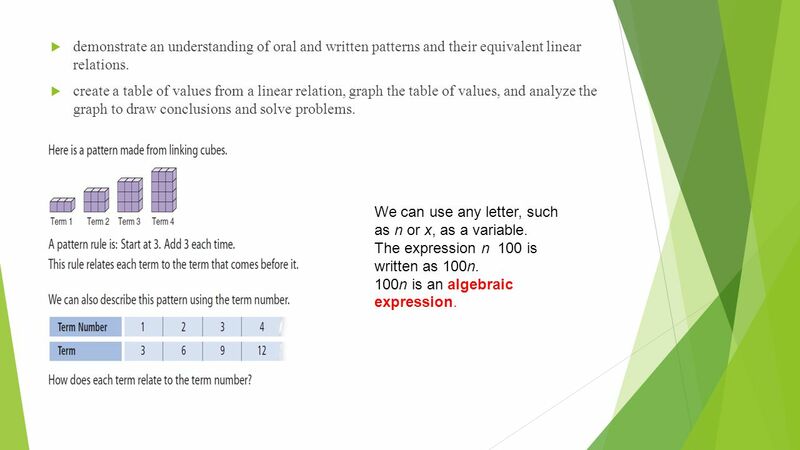 9  demonstrate an understanding of oral and written patterns and their equivalent linear relations.  create a table of values from a linear relation, graph the table of values, and analyze the graph to draw conclusions and solve problems. We can use any letter, such as n or x, as a variable. The expression n 100 is written as 100n. 100n is an algebraic expression. 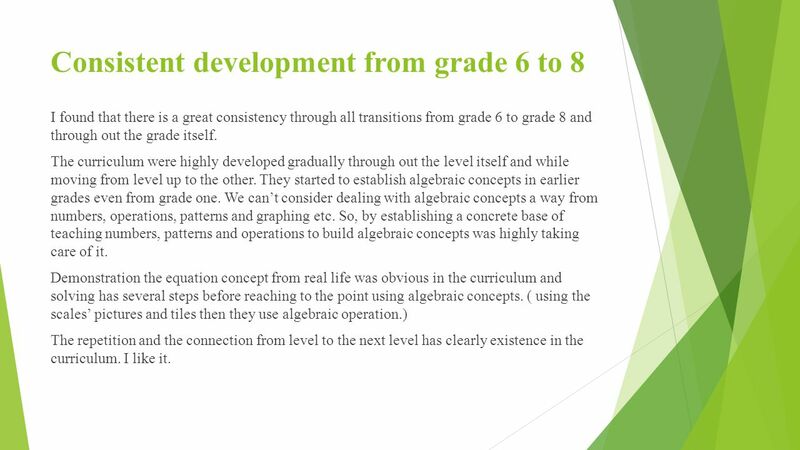 18 Consistent development from grade 6 to 8 I found that there is a great consistency through all transitions from grade 6 to grade 8 and through out the grade itself. The curriculum were highly developed gradually through out the level itself and while moving from level up to the other. 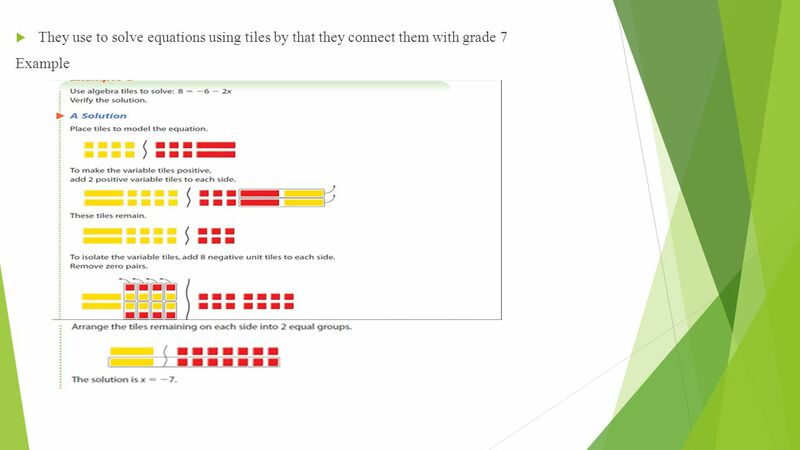 They started to establish algebraic concepts in earlier grades even from grade one. 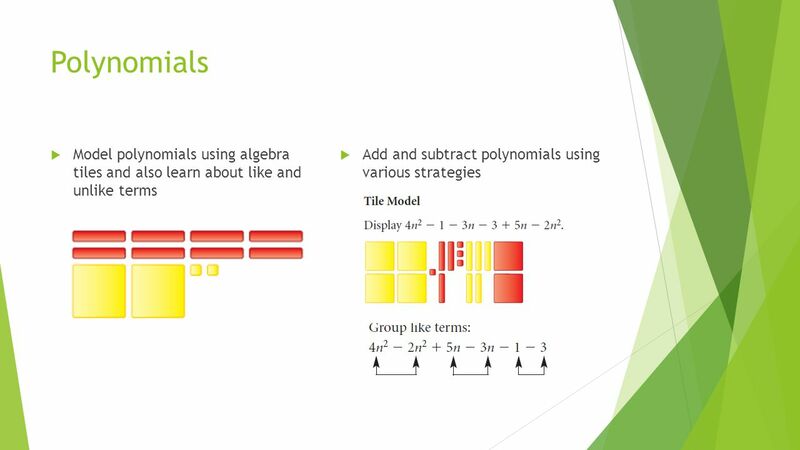 We can’t consider dealing with algebraic concepts a way from numbers, operations, patterns and graphing etc. So, by establishing a concrete base of teaching numbers, patterns and operations to build algebraic concepts was highly taking care of it. 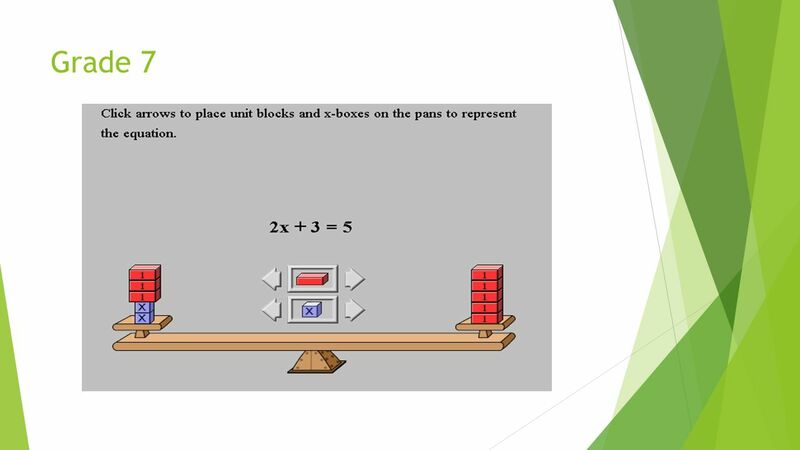 Demonstration the equation concept from real life was obvious in the curriculum and solving has several steps before reaching to the point using algebraic concepts. 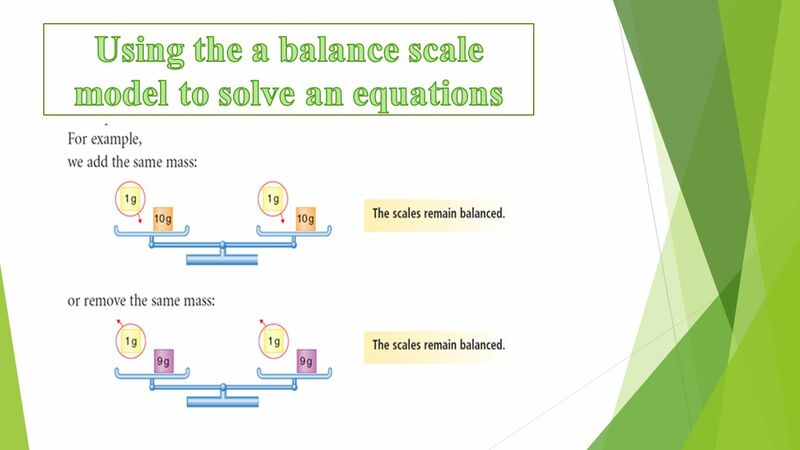 ( using the scales’ pictures and tiles then they use algebraic operation.) The repetition and the connection from level to the next level has clearly existence in the curriculum. I like it. 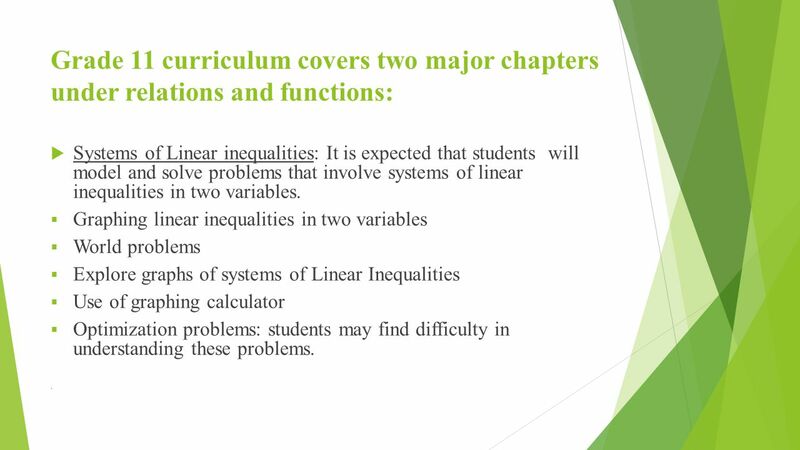 26 Inconsistencies  Linear inequalities may overwhelm students as it is an entirely new topic for them. 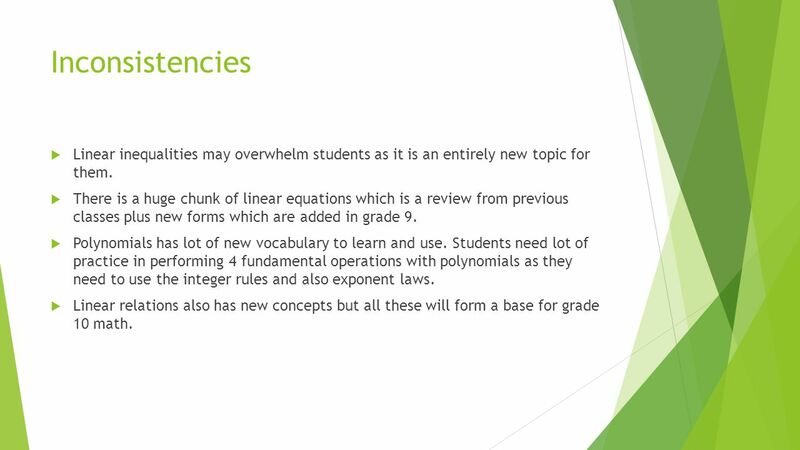  There is a huge chunk of linear equations which is a review from previous classes plus new forms which are added in grade 9. 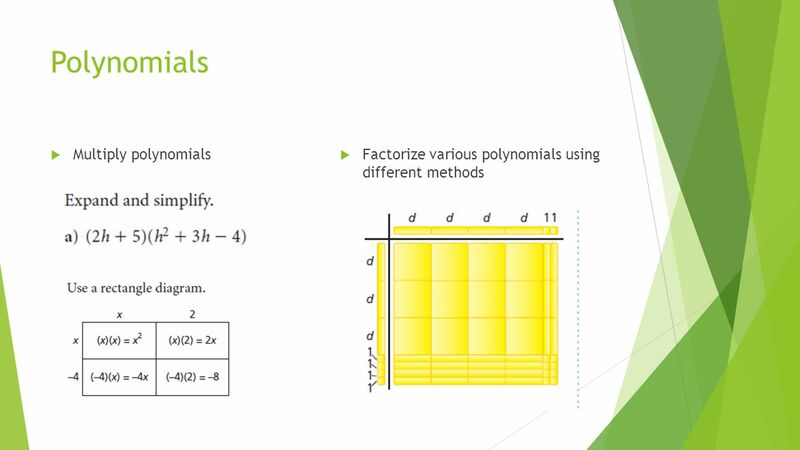  Polynomials has lot of new vocabulary to learn and use. 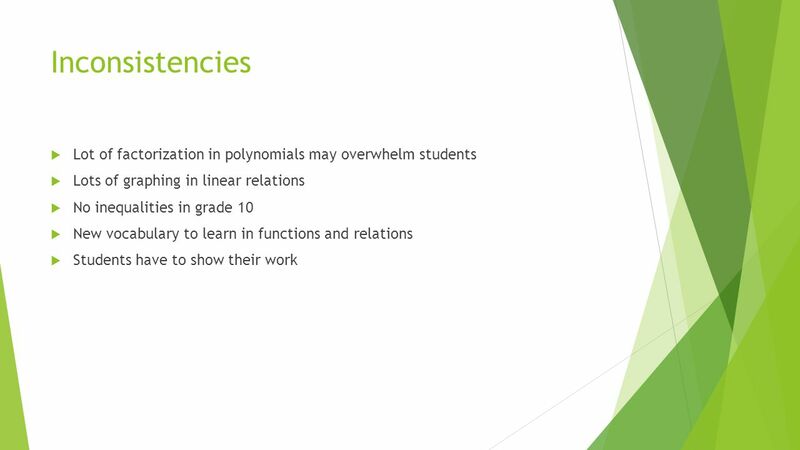 Students need lot of practice in performing 4 fundamental operations with polynomials as they need to use the integer rules and also exponent laws. 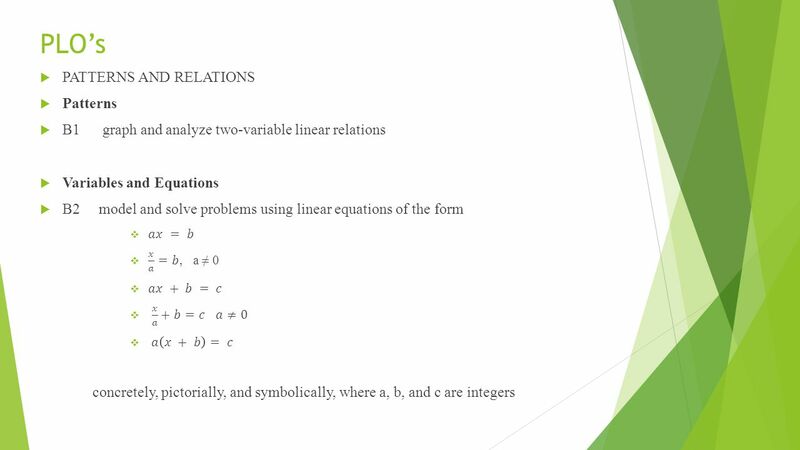  Linear relations also has new concepts but all these will form a base for grade 10 math. 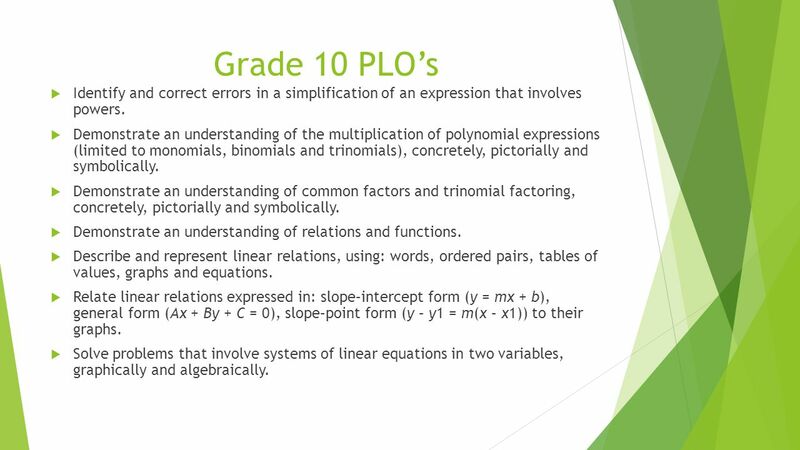 27 Grade 10 PLO’s  Identify and correct errors in a simplification of an expression that involves powers. 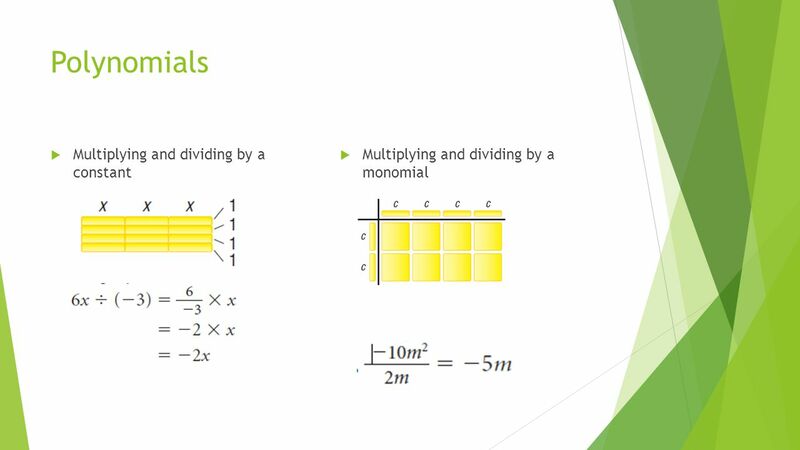  Demonstrate an understanding of the multiplication of polynomial expressions (limited to monomials, binomials and trinomials), concretely, pictorially and symbolically. 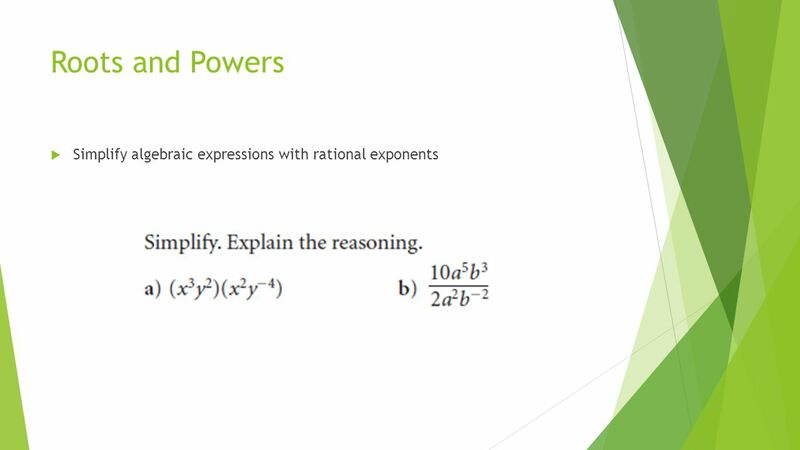  Demonstrate an understanding of common factors and trinomial factoring, concretely, pictorially and symbolically. 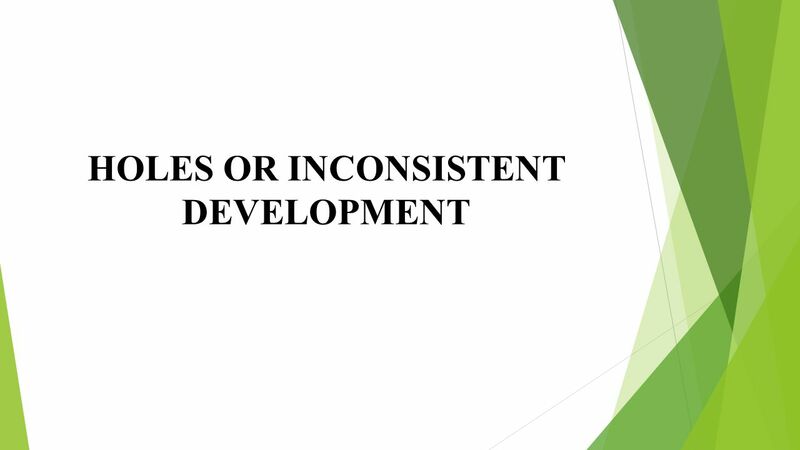  Demonstrate an understanding of relations and functions. 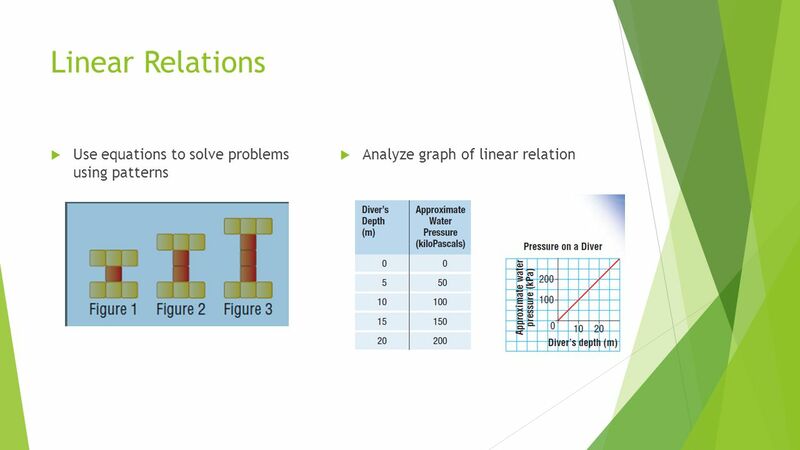  Describe and represent linear relations, using: words, ordered pairs, tables of values, graphs and equations. 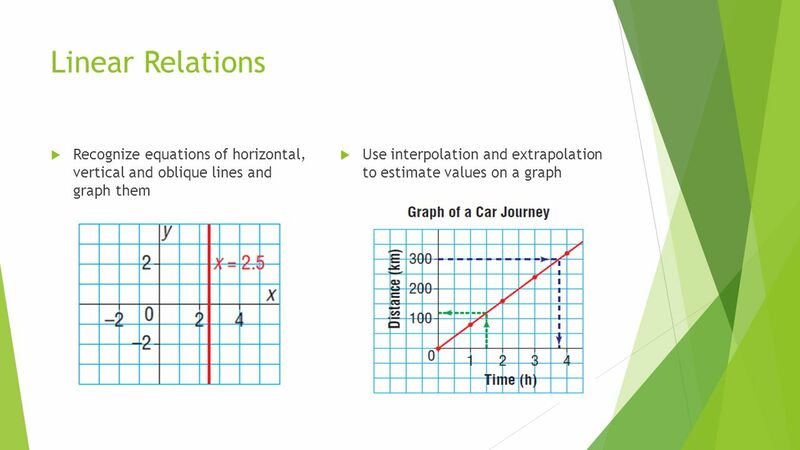  Relate linear relations expressed in: slope–intercept form (y = mx + b), general form (Ax + By + C = 0), slope–point form (y – y1 = m(x – x1)) to their graphs. 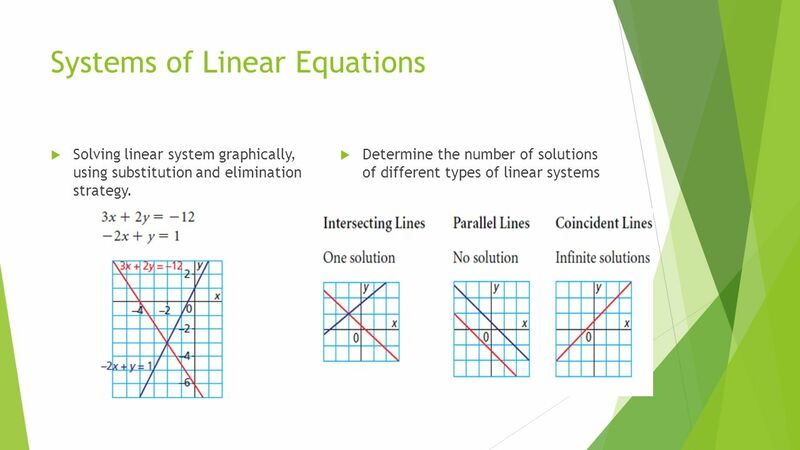  Solve problems that involve systems of linear equations in two variables, graphically and algebraically. 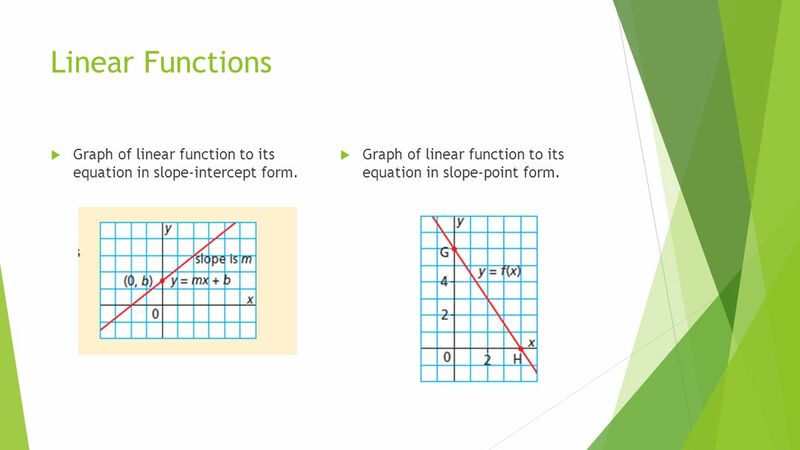 31 Linear Functions  Graph of linear function to its equation in slope-intercept form.  Graph of linear function to its equation in slope-point form. 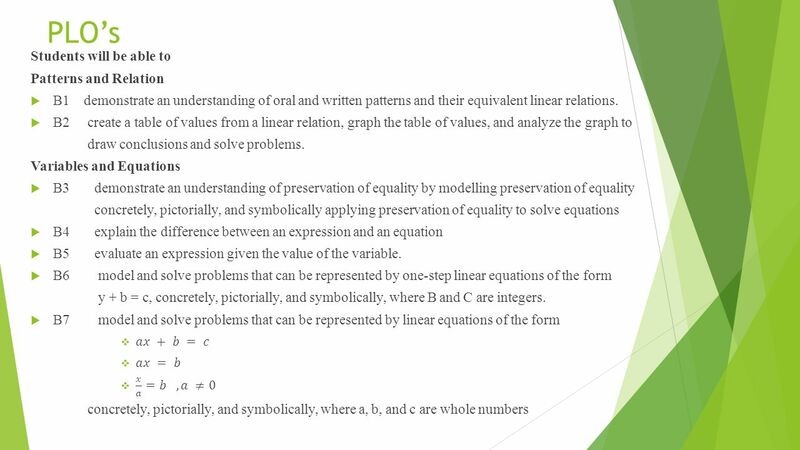 36 Grade 11 curriculum covers two major chapters under relations and functions:  Systems of Linear inequalities: It is expected that students will model and solve problems that involve systems of linear inequalities in two variables. 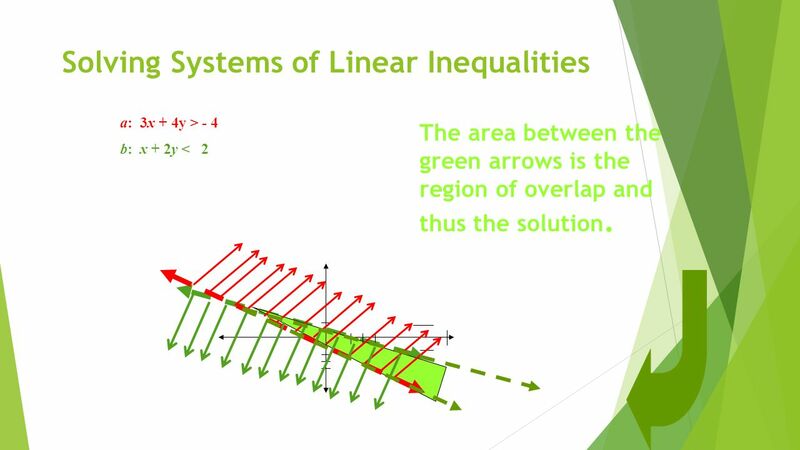  Graphing linear inequalities in two variables  World problems  Explore graphs of systems of Linear Inequalities  Use of graphing calculator  Optimization problems: students may find difficulty in understanding these problems..
37 Solving Systems of Linear Inequalities a: 3x + 4y > - 4 b: x + 2y < 2 The area between the green arrows is the region of overlap and thus the solution. 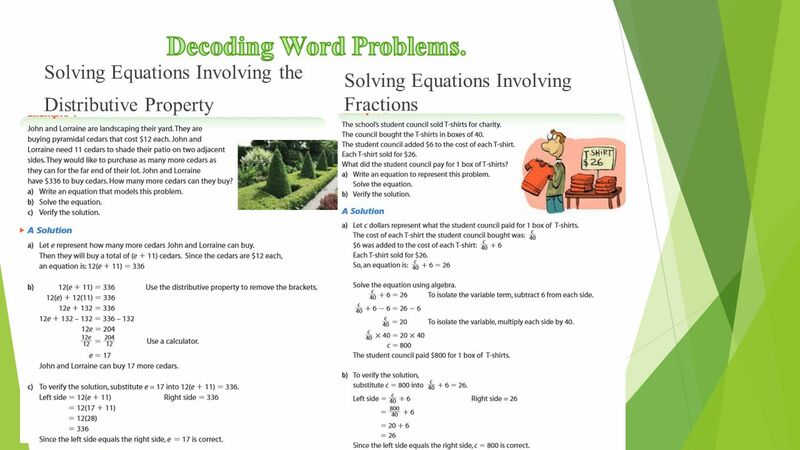 38 Solve problems by modelling systems of linear inequalities. 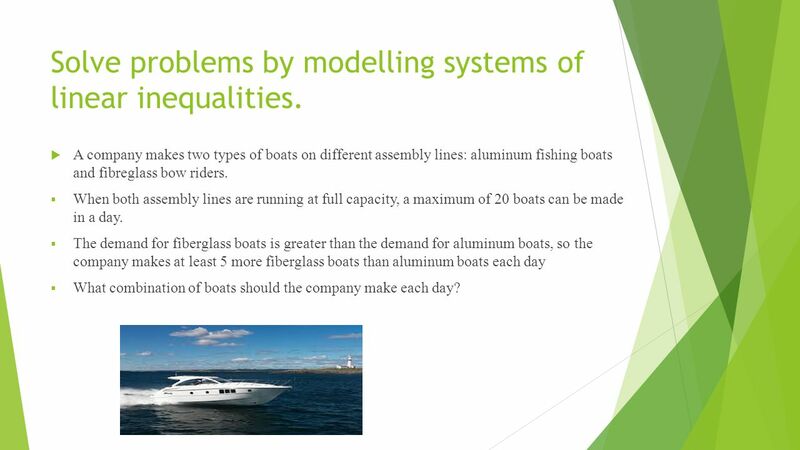  A company makes two types of boats on different assembly lines: aluminum fishing boats and fibreglass bow riders.  When both assembly lines are running at full capacity, a maximum of 20 boats can be made in a day.  The demand for fiberglass boats is greater than the demand for aluminum boats, so the company makes at least 5 more fiberglass boats than aluminum boats each day  What combination of boats should the company make each day? 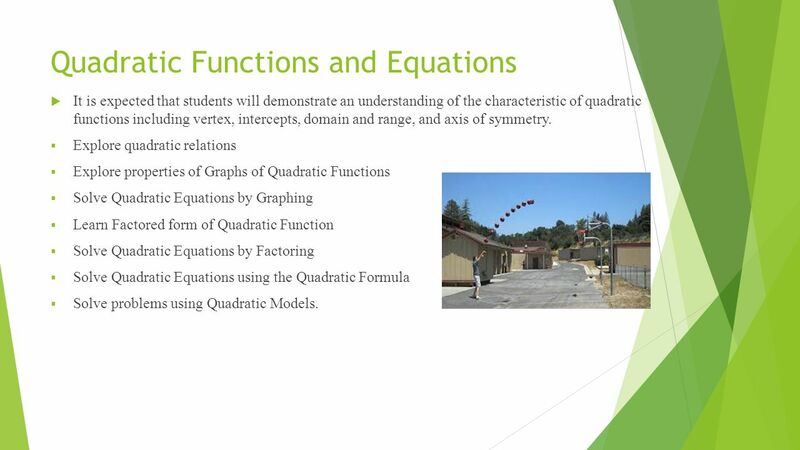 39 Quadratic Functions and Equations  It is expected that students will demonstrate an understanding of the characteristic of quadratic functions including vertex, intercepts, domain and range, and axis of symmetry. 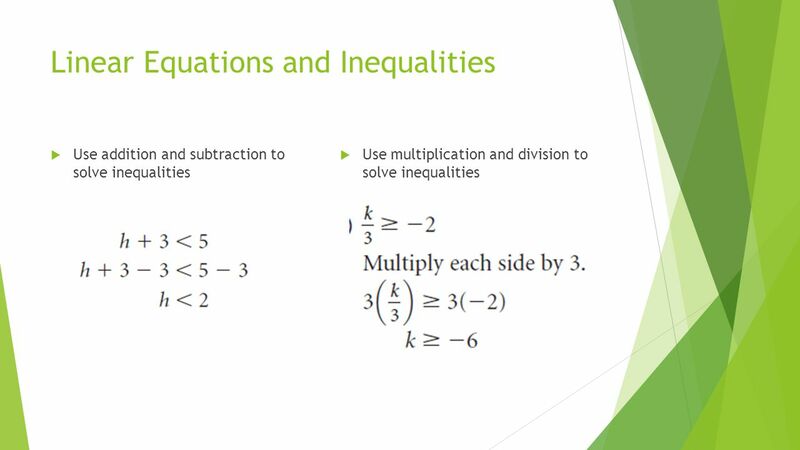  Explore quadratic relations  Explore properties of Graphs of Quadratic Functions  Solve Quadratic Equations by Graphing  Learn Factored form of Quadratic Function  Solve Quadratic Equations by Factoring  Solve Quadratic Equations using the Quadratic Formula  Solve problems using Quadratic Models. 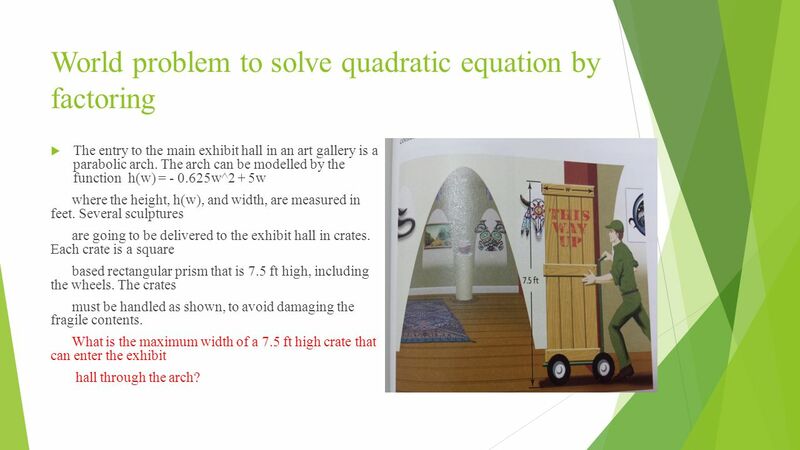 40 World problem to solve quadratic equation by factoring  The entry to the main exhibit hall in an art gallery is a parabolic arch. The arch can be modelled by the function h(w) = - 0.625w^2 + 5w where the height, h(w), and width, are measured in feet. Several sculptures are going to be delivered to the exhibit hall in crates. Each crate is a square based rectangular prism that is 7.5 ft high, including the wheels. The crates must be handled as shown, to avoid damaging the fragile contents. What is the maximum width of a 7.5 ft high crate that can enter the exhibit hall through the arch? 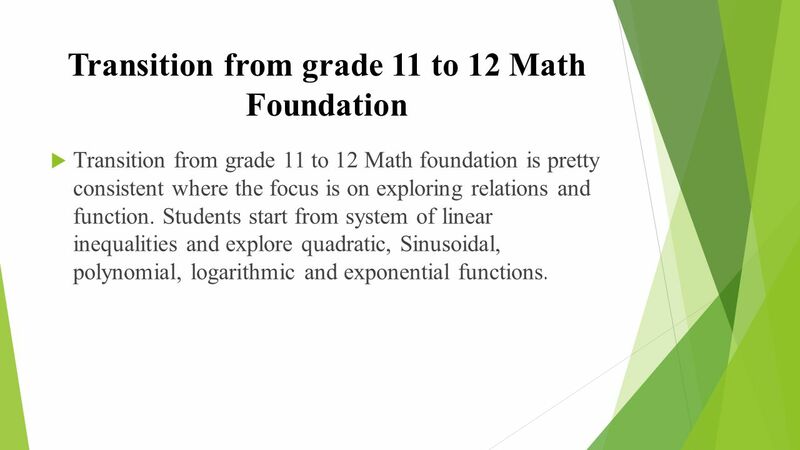 41 Grade 12 Foundation curriculum cover three major functions :  Sinusoidal functions: It is expected that students will represent data, using sinusoidal functions to solve problems. 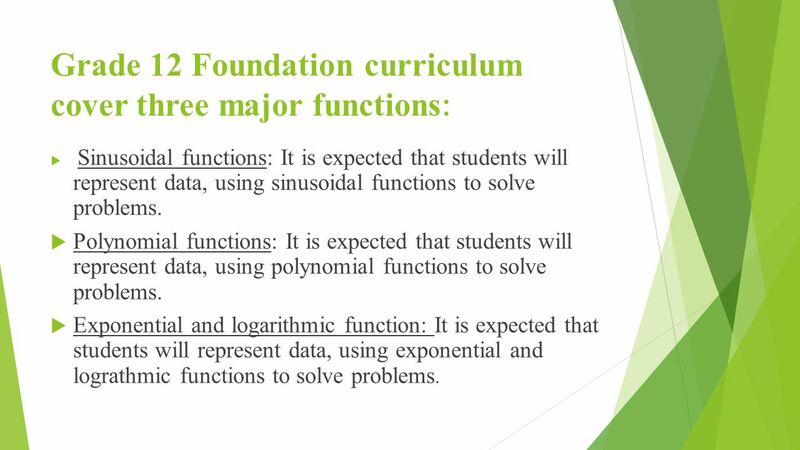  Polynomial functions: It is expected that students will represent data, using polynomial functions to solve problems. 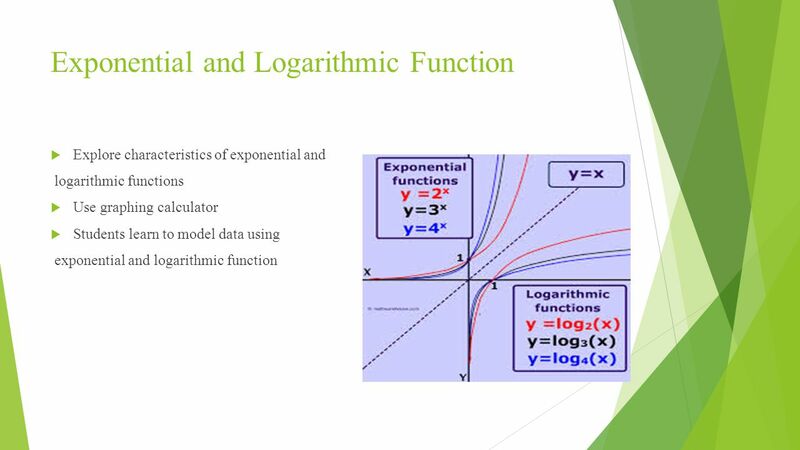  Exponential and logarithmic function: It is expected that students will represent data, using exponential and lograthmic functions to solve problems. 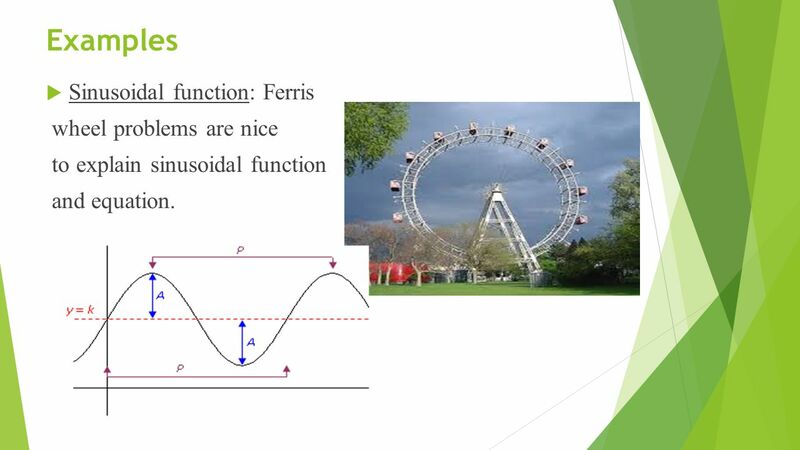 42 Examples  Sinusoidal function: Ferris wheel problems are nice to explain sinusoidal function and equation. 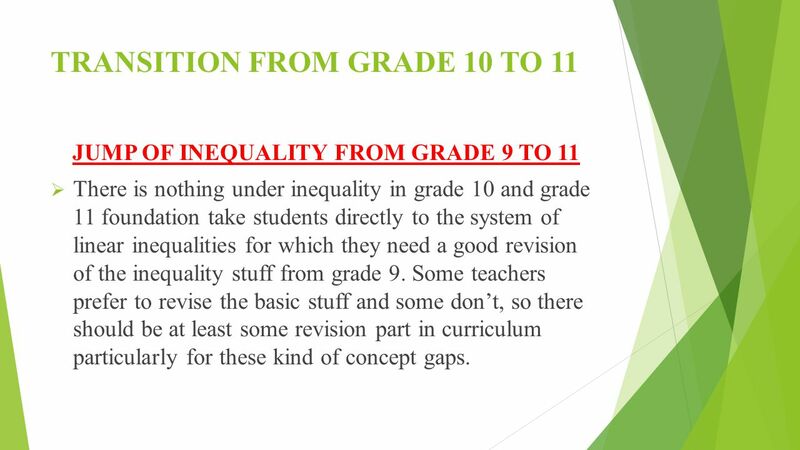 46 TRANSITION FROM GRADE 10 TO 11 JUMP OF INEQUALITY FROM GRADE 9 TO 11  There is nothing under inequality in grade 10 and grade 11 foundation take students directly to the system of linear inequalities for which they need a good revision of the inequality stuff from grade 9. 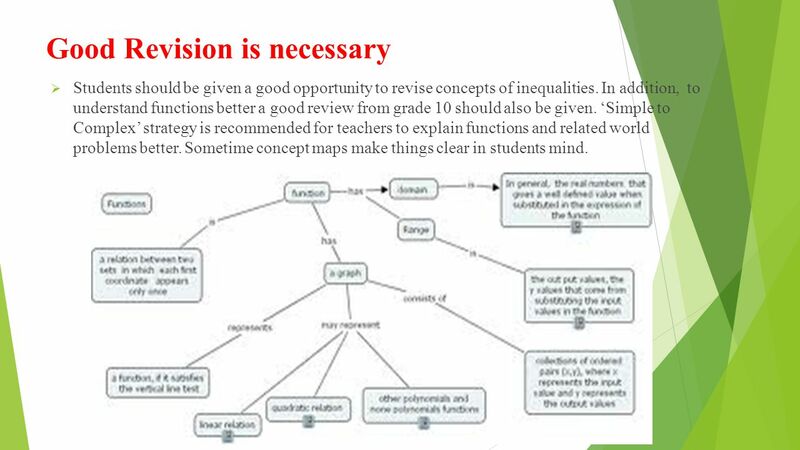 Some teachers prefer to revise the basic stuff and some don’t, so there should be at least some revision part in curriculum particularly for these kind of concept gaps. 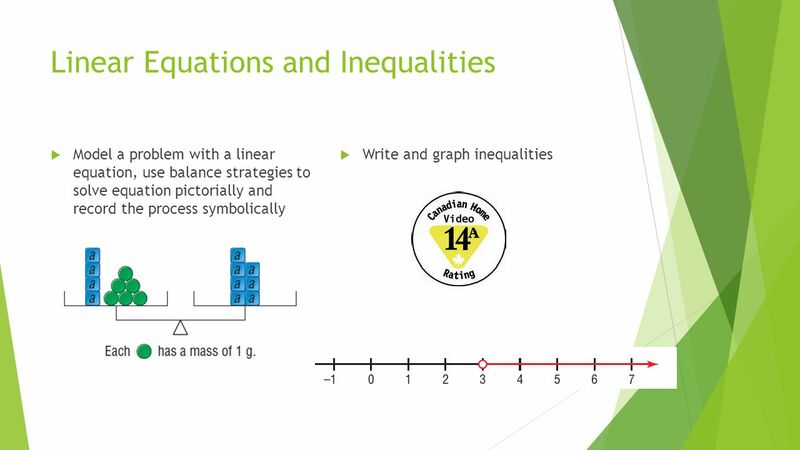 47 Good Revision is necessary  Students should be given a good opportunity to revise concepts of inequalities. 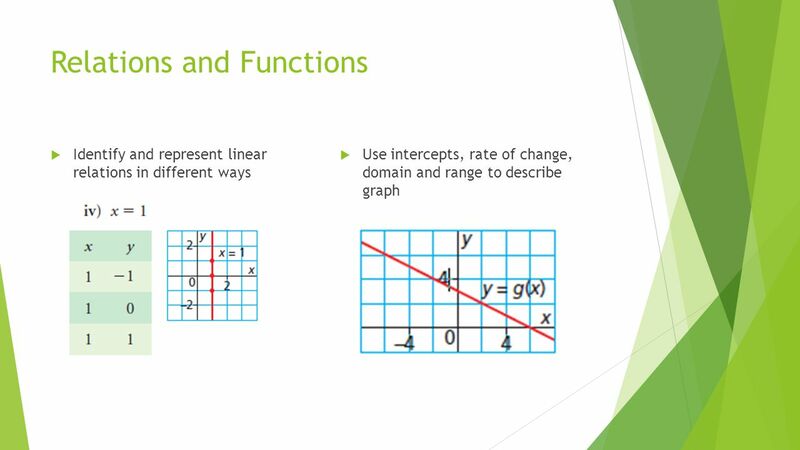 In addition, to understand functions better a good review from grade 10 should also be given. 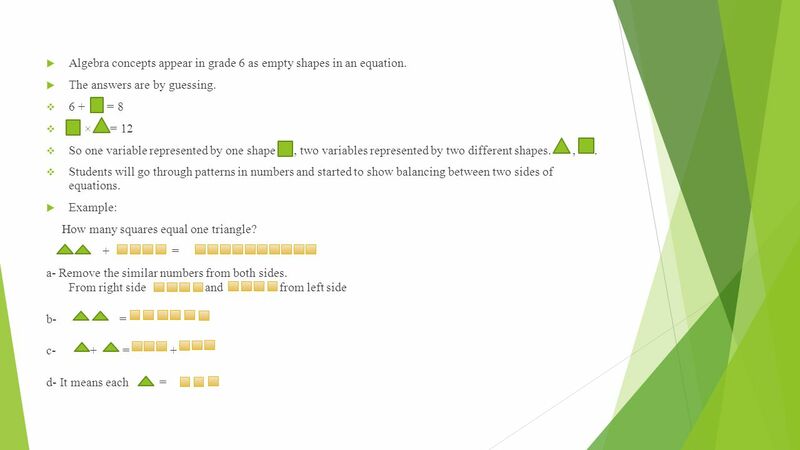 ‘Simple to Complex’ strategy is recommended for teachers to explain functions and related world problems better. Sometime concept maps make things clear in students mind. 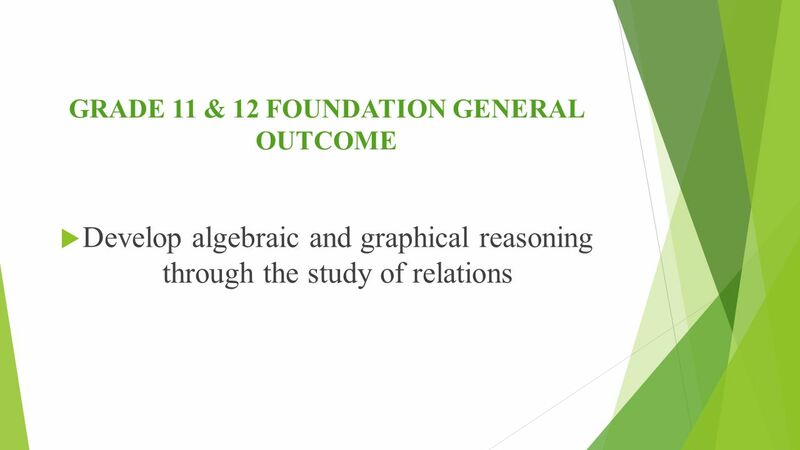 48 Transition from grade 11 to 12 Math Foundation  Transition from grade 11 to 12 Math foundation is pretty consistent where the focus is on exploring relations and function. 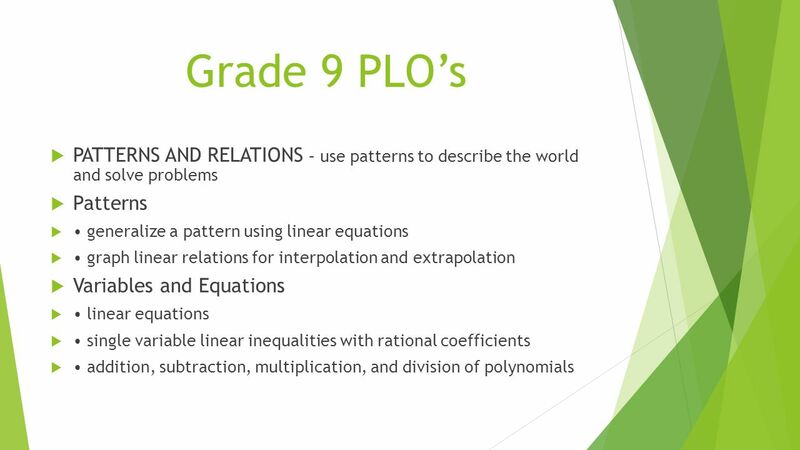 Students start from system of linear inequalities and explore quadratic, Sinusoidal, polynomial, logarithmic and exponential functions. 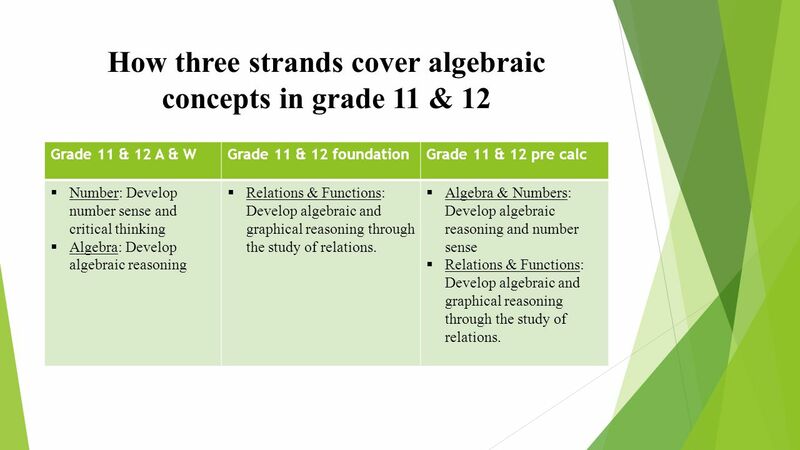 49 How three strands cover algebraic concepts in grade 11 & 12 Grade 11 & 12 A & WGrade 11 & 12 foundationGrade 11 & 12 pre calc  Number: Develop number sense and critical thinking  Algebra: Develop algebraic reasoning  Relations & Functions: Develop algebraic and graphical reasoning through the study of relations. 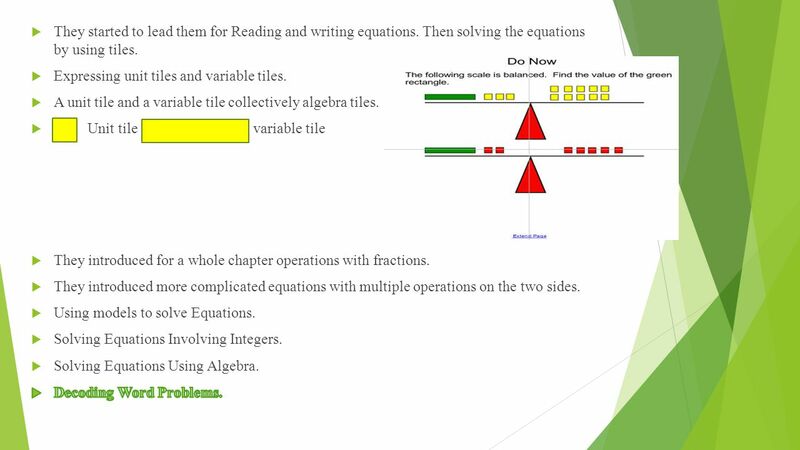  Algebra & Numbers: Develop algebraic reasoning and number sense  Relations & Functions: Develop algebraic and graphical reasoning through the study of relations. 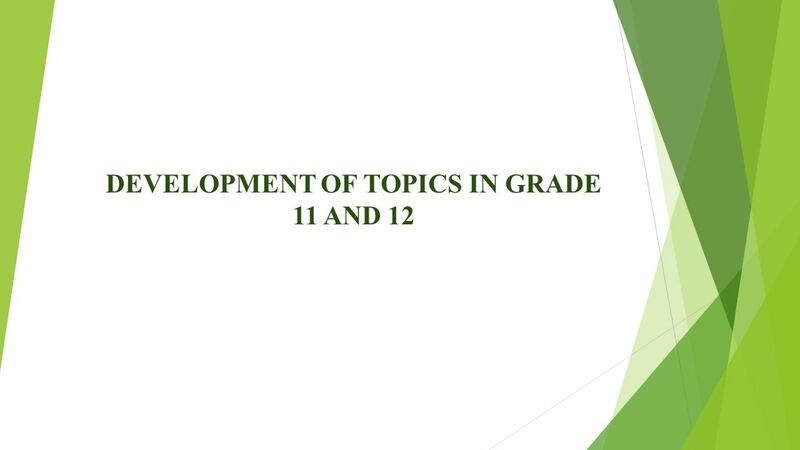 Download ppt "TOPIC ANALYSIS Algebraic concepts: Equations, Inequalities, Functions BY: Kamal, Rashda, and Sana." Jeopardy Exponents Operations on Real Numbers Geometry Polynomials Properties of Real Numbers Q $100 Q $200 Q $300 Q $400 Q $500 Q $100 Q $200 Q $300. 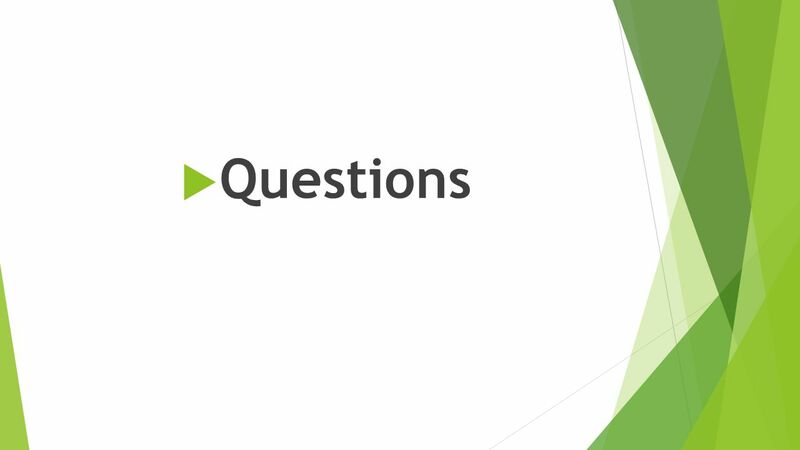 Spring 2012 Student Performance Analysis Algebra I Standards of Learning Presentation may be paused and resumed using the arrow keys or the mouse. 1 Revised. FINAL EXAM ALGEBRA 2014 DETROIT PUBLIC SAFETY ACADEMY MS. DEGAIN REVIEW MATERIALS. 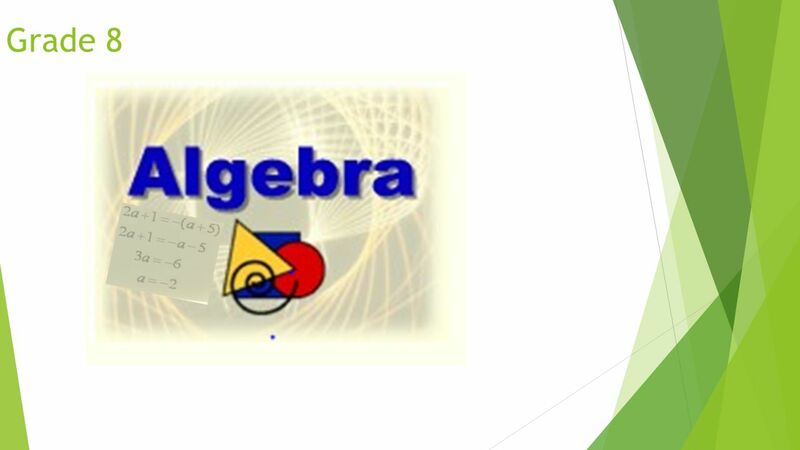 Copyright © 2013, 2009, 2005 Pearson Education, Inc. 1 3 Polynomial and Rational Functions Copyright © 2013, 2009, 2005 Pearson Education, Inc.
A Quick Review of MTH070 Elementary Algebra Algebraic Notation Algebraic Properties & Simplifying Expressions Linear Equations, Formulas, & Inequalities. 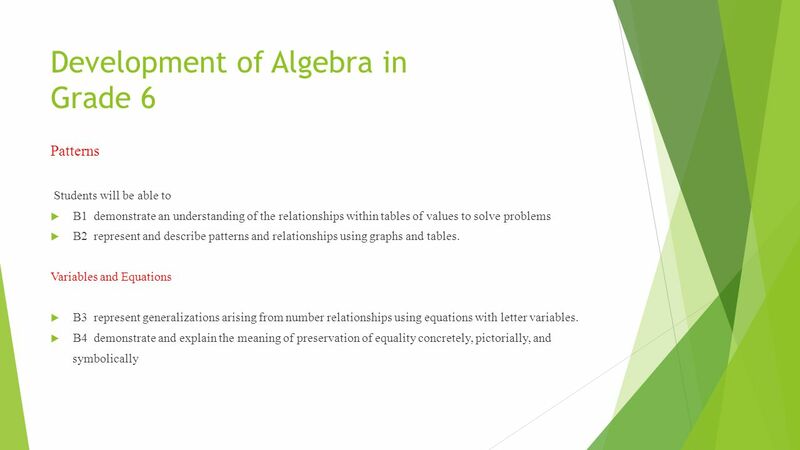 A Quick Review of MTH060 Elementary Algebra I Algebraic Notation Algebraic Properties & Simplifying Expressions Linear Equations, Formulas, & Inequalities. College Algebra Exam 2 Material. Absolute Value: A number’s distance from zero on a number line. A number’s absolute value is nonnegative. THE REAL NUMBERS College Algebra. Sets Set notation Union of sets Intersection of sets Subsets Combinations of three or more sets Applications. Digital “ABC” Book By: Scott Bowers. 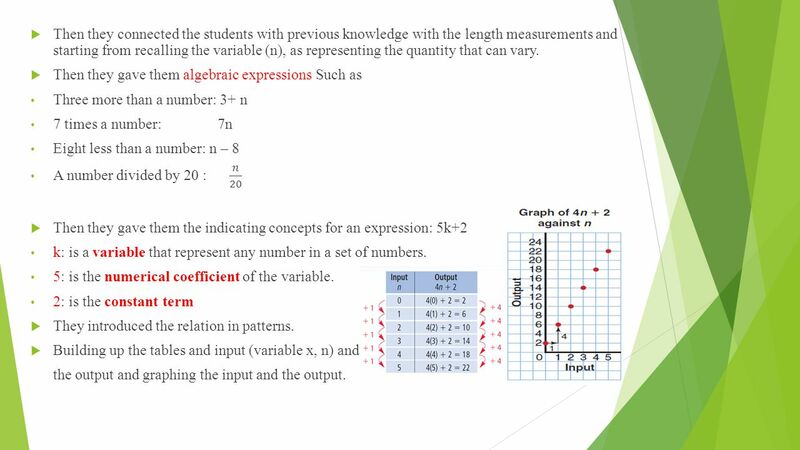 5.1 Linear Equations A linear equation in one variable can be written in the form: Ax + B = 0 Linear equations are solved by getting “x” by itself on. 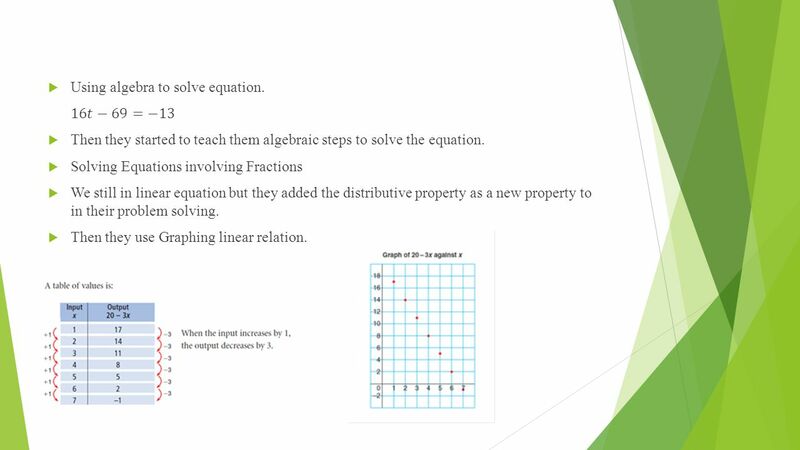 Algebra Review. Polynomial Manipulation Combine like terms, multiply, FOIL, factor, etc. 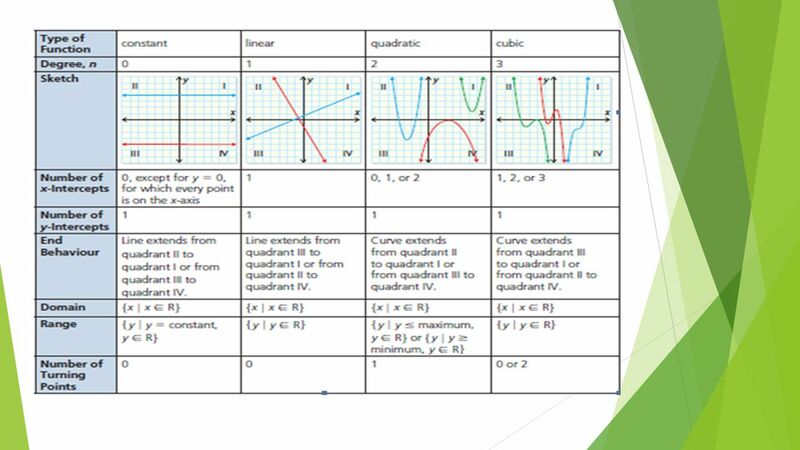 Graph quadratic equations. Complete the square to graph quadratic equations. Use the Vertex Formula to graph quadratic equations. Solve a Quadratic Equation. 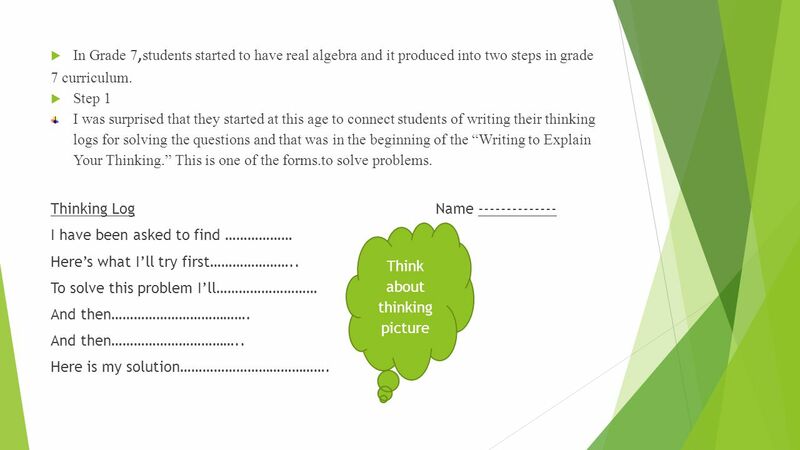 Standard #1: Write an Algebraic Expression from a word problem. Text Section: 1.1.